Home computer Tricks Windows How to format an SD card / USB flash drive that is in RAW in Windows 10/8/7? How to format an SD card / USB flash drive that is in RAW in Windows 10/8/7? 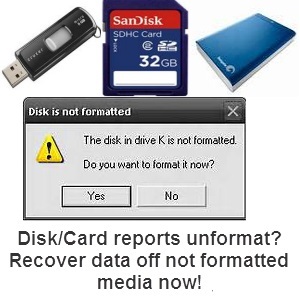 Sometimes when you plug your SD card, USB flash drive, pen drive or external hard drive into the PC, you receive the unformatted disk error or you must format the drive. Windows 10 can not format the Micro SD card in RAW, how to do? "My 64GB Micro SD card has changed to a RAW file system when I inserted it on my PC on Windows 10. And when I tried to format the card, Windows failed to Format. How do I format the SD card to RAW? " And when you try to run CHKDSK to check and repair the error, you may receive another message stating "This type of file system is RAW. Chkdsk is not available for RAW disks ". If an error occurs, the SD card or other external USB device has become RAW and can not be accessed. To correct the problem, you must convert RAW to FAT32, NTFS or any other file system by formatting. But usually, Windows can not help you realize it. So is there another way to repair the SD card in RAW? Do not worry! With disk-formatting functionality and an easy-to-use interface, the EaseUS partition software is recommended as the best SD RAW formatting software. It can help you easily format the SD card, USB flash drive, pen drive or external hard drive from RAW to NTFS, FAT32, EXT2, EXT3 in Windows 10/8/7. Step 1. Connect the SD card, USB flash drive, pen drive or external hard drive to RAW to the PC, start the software, right-click the disk, and choose "Format and Partition". Step 2. Configure the desired label in the Partition Label box, and then select the NTFS, FAT32, EXT2, or EXT3 file system from the "File System" drop-down list on the disk. Step 3. Choose the cluster size (512 bytes, 1, 2, 4 ... 64 KB) from the "Cluster Size" drop-down list and click "OK" to continue. Step 4. Click "Apply" to format and repair the SD RAW card, USB flash drive, pen drive, or external hard drive. Note: If you have important data on the SD card, USB flash drive, pen drive or external hard drive, try EaseUS the free data recovery software to recover them from the RAW file system before formatting.